I love lasagna, but not all the calories and carbs that come with it! 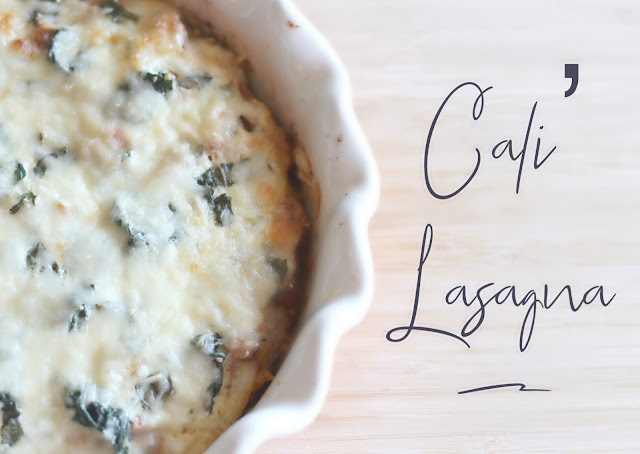 This recipe has all the goodness of lasagna, but lightened up for a skinnier version! 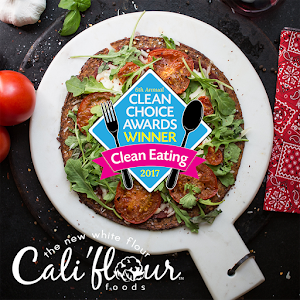 Cali'flour Foods pre-made cauliflower crusts are used in place of traditional lasagna noodles making this a low-carb, gluten-free, healthier for you recipe! 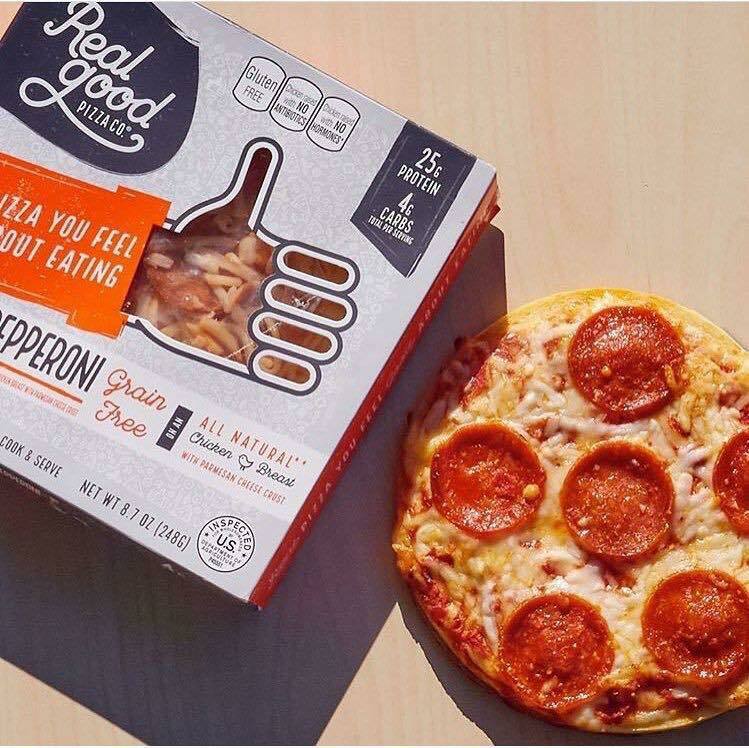 The Lite Cali'flour Foods crusts are only 180 Calories, 6 g of Carbs, and 9 g of Fat for the ENTIRE crust!!! It also has 15 g of Protein! That is one heck of a crust! They are made with only a few ingredients which include fresh cauliflower, egg whites, mozzarella, and spices. That's it! No added funky stuff which is why I love them! The Lite crusts count as 1/2 a Lean and 3 Greens on the Optavia or Medifast program! Use them for pizza crusts, quiche, wraps, taco shells... the possibilities are endless! Use Code "SANDY" to save 10% off your order! Start off by spraying a non-stick skillet with cooking spray. Saute the onions in the skillet until tender, about 5 min. Many people think you need oil to saute them over the stove, but it really isn't necessary as long as you use a non-stick pan. 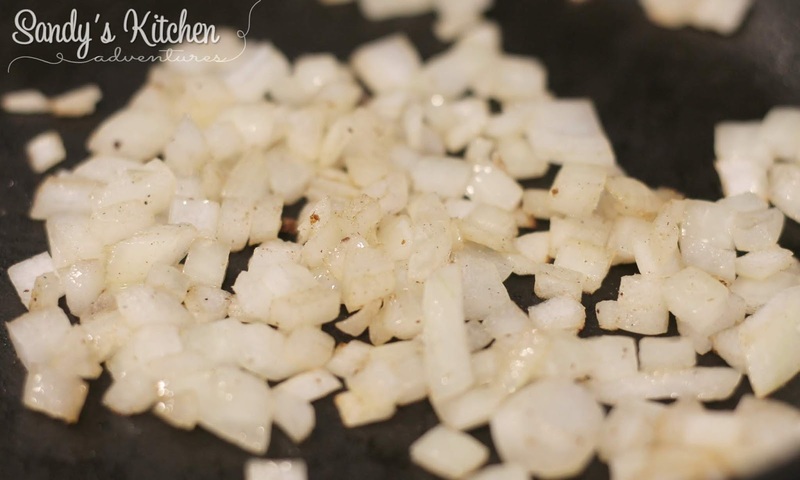 Add the uncooked meat to the cooked onions. When making the meat sauce for the lasagna, you can use Jennie-O Sweet Italian Chicken Sausage or 95 to 97% lean ground beef or turkey. I used Jennie-O Sweet Italian Chicken Sausage because I love how it already has the Italian flavors mixed in, but it does have a strong fennel taste. If you do not like fennel, use ground beef or turkey. If you use Jennie-O, skip the salt. 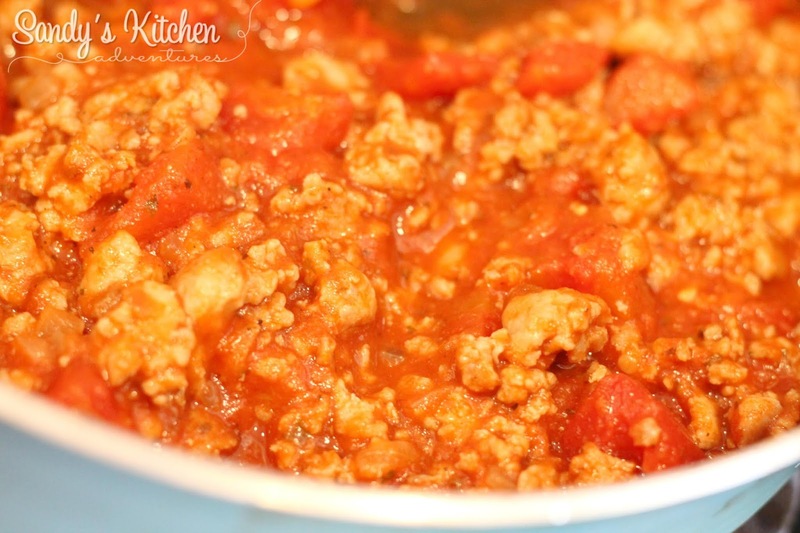 Add an approved marinara sauce and Italian diced tomatoes to the meat mixture and let it simmer for about 5 min. Set aside. For years I have always added a can of diced tomatoes to my marinara sauce because I love the bursts of yummy tomato flavor from the chunks of tomatoes! Make sure you get diced tomatoes that are less than 5 g of Carbs per 1/2 cup! Some brands are 10 g of Carbs per 1/2 cup! For some reason, I have the most luck with generic store brands such as Great Value or Kroger brand so check your labels! 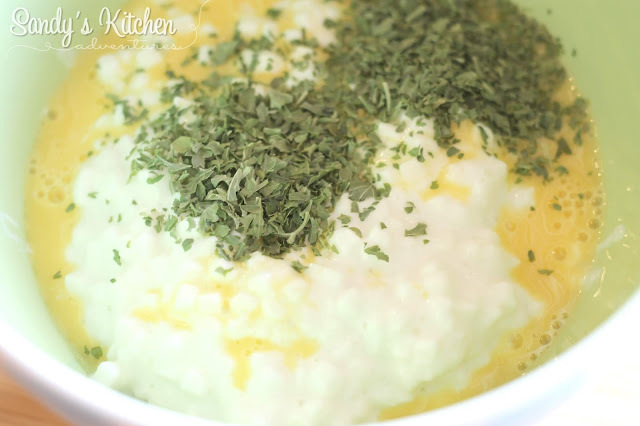 Combine cottage cheese, egg beaters, and dried parsley in a small bowl. Why did I use cottage cheese instead of ricotta cheese? Simply because I can have more per serving on my program. 12 ounces of 2% cottage cheese versus 8 ounces of part skim ricotta cheese are both 1 Lean. 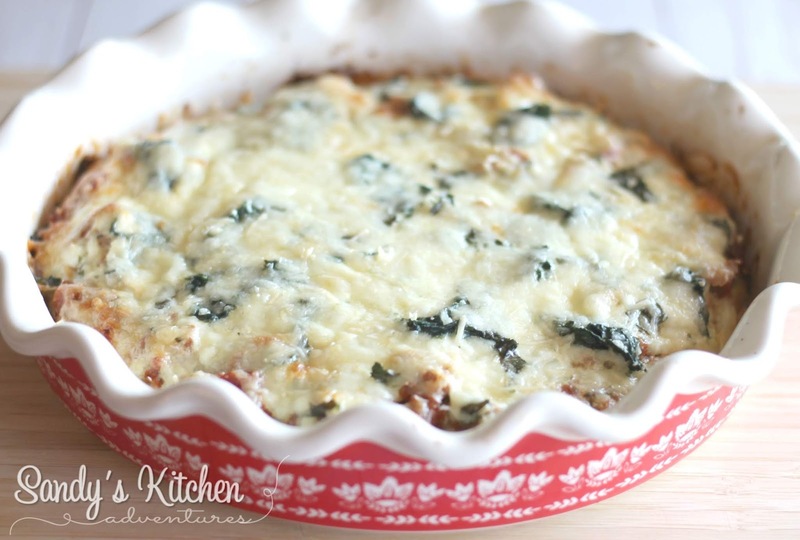 Pick your cheese, but in this recipe... more is better so cottage cheese wins for me! 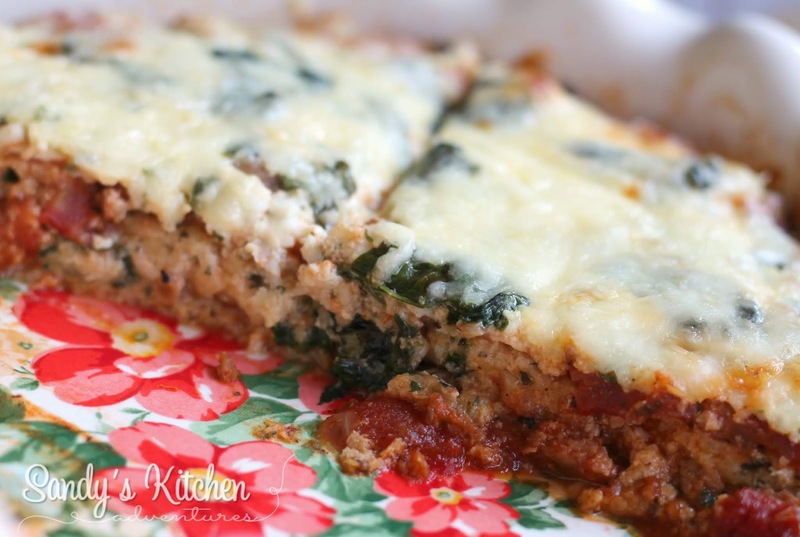 Spinach adds more nutrients into this lasagna! At only 7 Calories a cup, it packs a healthy dose Vitamins A and C plus folate, iron and calcium. 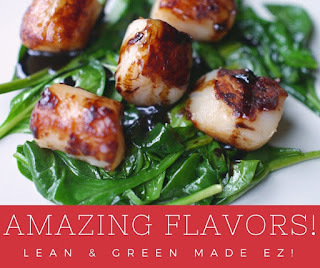 Pop a bowl of 2 cups of baby spinach in the microwave for 1 to 2 min with a microwave safe lid or plastic wrap, and you will have nice wilted cooked spinach. Time for layering! Spoon 1/3 of the meat mixture on the bottom of a 9 inch deep dish pie plate. 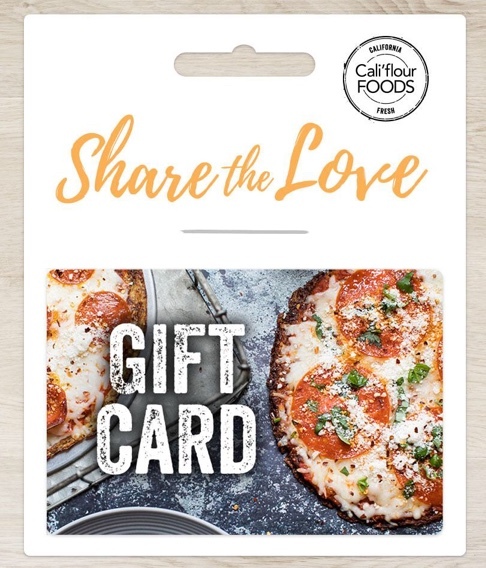 Place a Cali'four Foods Lite Crust on top. Then add 1/3 more of the meat mixture, half the cottage cheese mixture, half the spinach, half the basil, half the fresh parmesan cheese, and half the mozzarella cheese. Then repeat the layers. Add the second Cali'flour Foods Lite Crust. Followed by the rest of the meat mixture, cottage cheese mixture, spinach, basil, and cheeses. Bake for 40 min and let set for 10 min. Dig in! 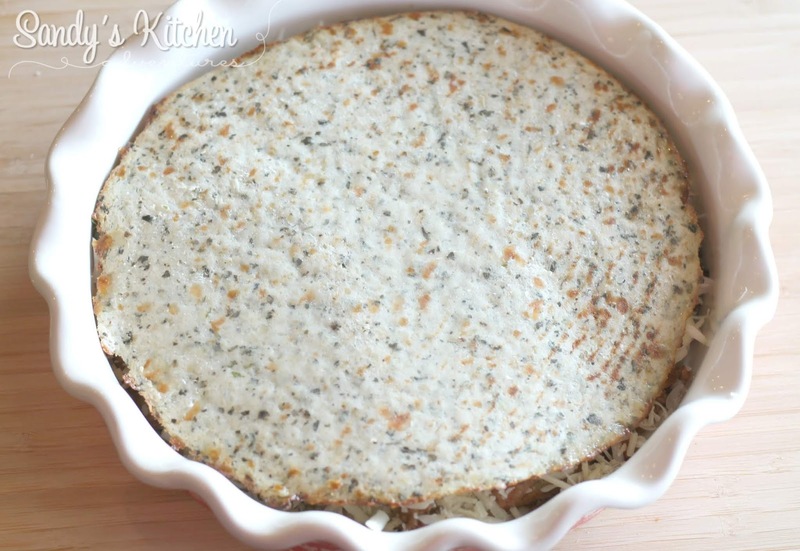 This makes 4 delicious servings so share with your family friends! They will thank you for it! Prepare Meat Mixture: Spray a non-stick skillet with cooking spray. Saute onions in the skillet until tender, about 5 min. Add the Italian chicken sausage (casings removed) or ground beef, salt (omit if using chicken sausage), black pepper, and garlic powder. Continue cooking until meat is brown. Drain off excess fat. Stir in marinara sauce and Italian diced tomatoes. Heat on low for 5 min. Set aside. Prepare Cottage Cheese Mixture: In a small bowl combine cottage cheese, egg beaters, and parsley. Set aside. 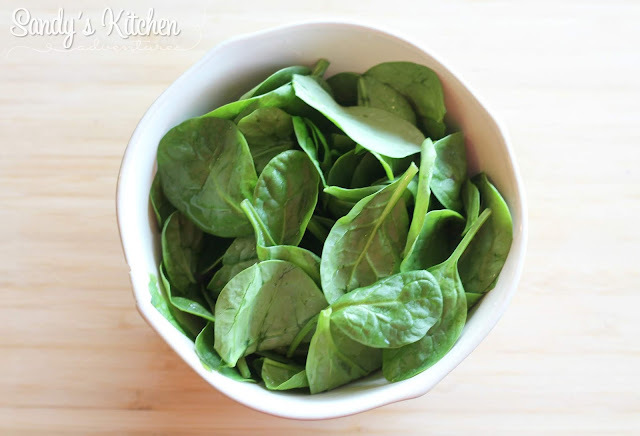 Prepare Spinach: Rinse spinach to clean spinach. While leaves are wet, place spinach in a microwave safe bowl. 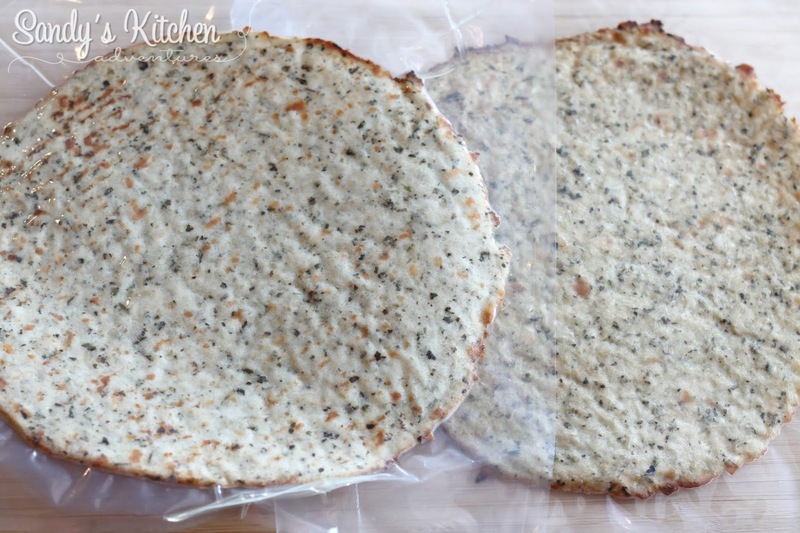 Cover with plastic wrap or use a microwave safe lid. No need to add additional water. Steam in the microwave for 1 to 2 min or until fully wilted. Chop and set aside. 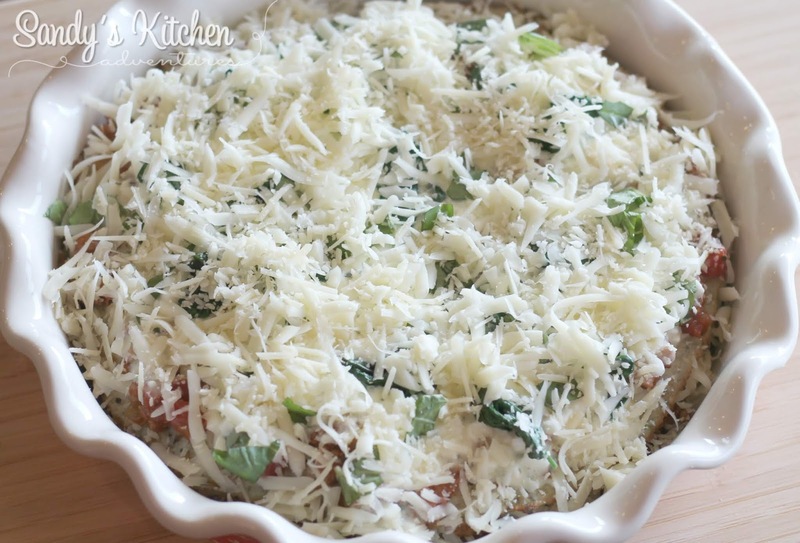 Assemble Lasagna: Preheat oven to 375 degrees. Spray a 9 inch deep dish pie pan with cooking spray. Spread 1/3 meat mixture at the bottom of the pie dish followed by one crust. Top the crust with 1/3 more of meat mixture, half of the cottage cheese mixture, half the spinach, 2 tbsp of basil, 2 tbsp of fresh parmesan cheese, and 1/2 cup of mozzarella cheese. Top with the second crust. 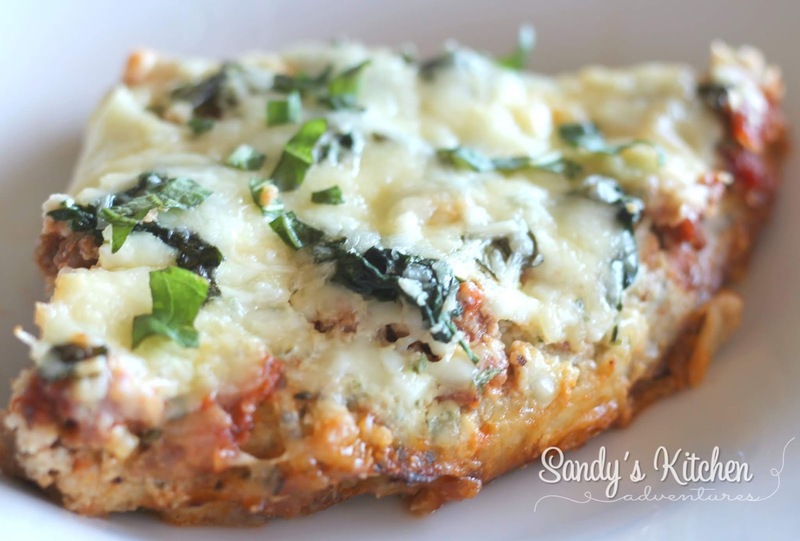 Spread 1/3 meat mixture, remaining cottage cheese mixture, remaining spinach, 2 tbsp of basil, 2 tbsp of parmesan cheese, and 1/2 cup of mozzarella. Bake for 40 to 45 min or until warmed through. Remove from oven and let stand 10 min. Enjoy!